A famous journalist once said something along the lines of “It’s ok for a journalist to have bias, as long as they admit that bias in their writing.” So, for sake of fair journalism, I am admitting my bias on this topic: I am not a Slightly Stoopid fan, at least I wasn’t until their latest release, Top of the World. Not that I’m trying to knock the boys from San Diego, they’re SoCal reggae rock sound has been getting crowds moving for well over a decade now and their live performance is something to be reckoned with, but I had never been too hot on their studio material. For me, I think it’s because I dig the SoCal regge rock vibe but I need something more. Luckily for me, Slightly Stoopid provides plenty more than your standard reggae rock fare on Top of the World. To me, this album definitely shows maturity in song writing and I can hear the influences they have gained while on the road and with working with a slew of guest artists. First off, I was expecting a bit more of a hard edge to this album based on its cover, though I should have considered the age-old saying about books. The album starts off chill with the title track and keeps that vibe pretty steady for the first few tracks; I couldn’t help but be pleasantly transported away to visions of relaxing on a beach while listening. The group gets nice and funky on the track, “Devil’s Door” and then picks things up with a little help from Angelo Moore of Fishbone on their collaborative track, “Ska Diddy.” The band brings things back down with a smooth hip hop groove featuring guests verses from Chali 2na on “Just Thinking” that gives you that vibe of rollin’ through Lincoln Heights in a Caddy, not that I’ve actually done that in Lincoln Heights, but one can imagine. In the Black Seeds-esque tune Pon da Horizon, band founders Miles Doughty and Kyle McDonald mix their perfectly blended vocal harmonies with some great horn lines from C-Money and saxophonist DeLa. I think this tune in particular reflects the group’s ability to draw influences from the sounds dominating the reggae scene right now while still keeping their sound true to their roots. Over the course of the 21 song release (no skits or interludes, all tracks are full songs), the band keeps things flowing well, spacing out their more experimental tunes with some classic SoCal reggae rock jams such as “Work”, “Serious Man”, and “We Don’t Wanna Go”. 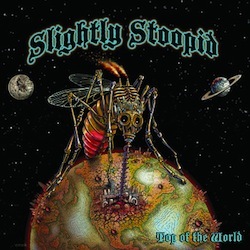 Slightly Stoopid shows their slightly softer side on R&B style tracks “I’m on Fire” and “Mona June” featuring Angela Hunte, and they get slightly bluesy with G-Love on their track “Hiphoppablues.” In all, I’m genuinely pleased they included so many tracks, even as bands these days tend to have shorter and shorter releases. This is a classic album in the sense that it should be taken as a whole, every track is enjoyable and everything flows so that I must admit it’s easy to just keep this album on repeat, especially if you’re planning on taking any long trips along the Cali coast. This album is guaranteed to set the right vibe no matter what mood you’re in; Slightly Stoopid has shown that even though they’ve been around since the days of Sublime, they’re ever evolving their sound to stay on Top of the World when it comes to the reggae scene.